Emma McQuiston is about to make history. She is about to become Britain’s first Black marchioness, which is one step below a duchess. 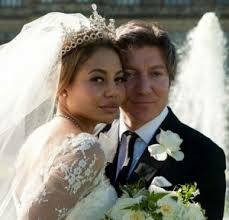 McQuiston currently holds the title of Viscountess Weymouth. McQuiston recently had an elaborate fairy tale wedding to Ceawlin Thynn. The wedding included 355 guests, a wait staff of almost 200 and a magician. Ceawlin Thynn is a British businessman and the second child of Alexander Thynn. Alexander Thynn is the infamous Marquess of Bath. He is known for his long hair, flamboyant clothing, and the images of a naked woman he painted over the walls of his estate, named Longleat. This is where McQuiston and Thynn now live. When Alexander passes away, Thynn and McQuiston will assume the titles of Marquess and Marchioness of Bath. McQuiston’s beginning is far from humble. She came from wealth also, her mother is a British socialite and her father is an Oxford University educated Nigerian oil tycoon. Even with her fortunate upbringing, McQuiston still feels lucky to be living at Longleat and marrying Thynn. In spite of her wealth, the 27-year-old British marchioness has career plans of her own. Emma is interested in fashion and has posed on the cover of You magazine just a couple of months ago. She also has ambitions of having her own cooking show and her own food blog. “My mum originally taught me to cook growing up. I just became, you know, more curious about nutrition and, you know, food from across the seas,” McQuiston explained. Congratulations, Emma McQuiston and much happiness on the wedding. Continue to inspire all young Black women and re-instill in all our hearts that fairy tales can still come true.